The world is seriously moving into cryptocurrency, For the ICO lovers, Telegram wanna make you rich. The favorite encrypted messaging app Telegram will establish its own Blockchain platform and cryptocurrency , according to sources knowledgeable about the issue. The new platform will be dubbed “Telegram Open Network” (TON) and will be based on an improved variant of Blockchain technology. “Telegram Open Network” ( TON ) will be a new, ‘third generation’ blockchain with superior capabilities, after Bitcoin and, later, Ethereum paved the way. Initial reports of this new platform surfaced earlier this year from Anton Rozenberg , a former worker of Telegram's publishing department Telegraph. Rozenberg posted on Facebook that which he claims is an advertorial to its new platform. He also pointed out that TON would help those below oppressive governments, because they'd be able to transfer cash natively via the messaging app. 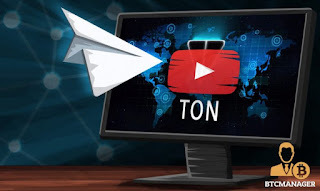 TON is going to be known as “Gram” and the platform will be integrated with many of the most popular messaging apps (it's not yet certain which ones). The platform will utilize light wallets, making it unnecessary for users to download a big and unwieldy Blockchain. Telegram is understood to be considering raising as much as $500 million in the pre-ICO sale at a potential total token value in the range of $3 billion to $5 billion. However, those figures could change before the ICO, which could come as soon as March. A pre-sale in an ICO is a minimum cap on investments (sometimes with discounts) to attract big investors (‘whales’) before a wider token sale to retail investors. The TON platform also will not need to go through a multi-year bootstrap period like new platforms, because the Telegram program already boasts 180 mln users. Tell us what you think about this via comment box. This was how bitcoin started and someone like me neglected it. And am sure we all know the price of 1bt now. So it's a good avenue and we should follow it up now. All you have to do is create a Portal to one of your Telegram groups and share the Portal URL with the other team http://bit.ly/telegram-groups.